Prepare the pasta according to the box directions, making sure to leave it al dente as it will cook more in the sauce – take a minute or so off the cooking time. 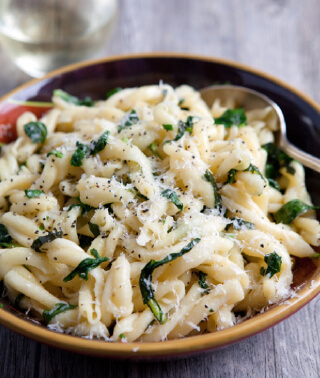 Reserve a ½ cup or so of the starchy pasta liquid; set aside and drain pasta into a colander. In a large skillet, add the butter and melt until it seems ready to brown. Add the pasta: coat with the butter. Add the tatsoi and toss in the skillet until it begins to wilt. Add the basil, chopped chives, salt and pepper, and ½ cup of Parmigiano Reggiano. Squeeze half a lemon over all. Serve with freshly grated Parmigiano Reggiano and remaining lemon.